This piece was discovered in Africa. It has been suggested Van Vaas may have exchanged it for passage 'out of the rainforest' while researching 'the transdimensional effects of light within the aurora of local rainbows'. A large oval pendant with stunning antique plate embedded with gems, it incorporates textured faux bone with a magical shimmering rainbow stone. It also has a huge real pearl drop (see large photographic plate)and comes in a presentation jewel case with sturdy chain for occasional wear. Stunning antique parts combine with faux bone and this unusual rainbow gem in this pendant once owned by Mrs H Petrie. It also has a huge real pearl drop (see large photographic plate) and comes in a presentation jewel case with sturdy chain for occasional wear. Such an unusual piece. 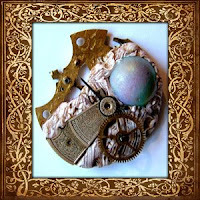 Based around a brass moon shape, with two deep pink gems, it incorporates textured faux bone with a magical shimmering rainbow gem. 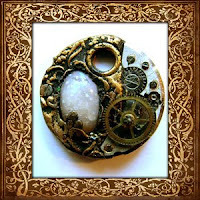 It is created from genuine antique parts and comes in a presentation jewel case. This large Radientorum is offered for sale as a pendant. Indicative of the year of it's creation it has a classical Art Noveau motif and a unique and glittering pyrite drop (see large photographic plate). It comes in a presentation jewel case with sturdy chain for occasional wear. The largest single piece of Moon Opal in existence is contained within this petite case. Surrounded by Art noveau vines and tiny cogs, this is a truly gorgeous piece. This discreet device was discovered in a secret hiding place under a floorboard at Boggle Hole near Whitby. It comes in a presentation jewel case with solid necklace for occasional wear. This piece can only be Mina Harkers very own necrometer. It has a very distinct motif, that of a creature in the order of Chiroptera. The strange gem is the largest in existence. It has a genuine Swarovski crystal droplet (see larger photographic plate). This delightful pocketwatch style device was Stevensons 'original' machine. 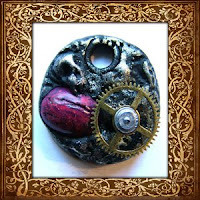 It is presented with workings displayed and a hardened red viscous resin type heart (of substance unknown, and best unasked after). It has a glass front (shown in large photographic image) and is created from genuine antique parts and comes in a presentation jewel case. 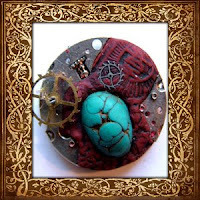 It features faux turquoise, cinnabar and gunmetal combined with brass cogs. Believed to Belong to Lt Harman, this delightful machine features faux turquoise, cinnebar and gunmetal combined with brass cogs.